An ex-VET is training owners in how to groom their pets back to health after opening the borough’s first cat and dog beauty salon. Svetlana Broussova, who emigrated from her native Russia nine years ago, set up Pet Universe, Atherton Road, Clayhall, with the backing of Camilla Al-Fayed – the daughter of super-rich Mohammed – after working in the Harrods department store pet section. “A lot of people don’t realise the benefits of grooming,” she said. “I want to make this business as educational as possible and provide help and information to people because grooming can really help treat and avoid skin diseases. “Dirt and germs caught up in animal hair can be really bad if inhaled by the owners, so it’s important they learn how to keep their animals clean and healthy. “Grooming animals can be very good for their mental state. 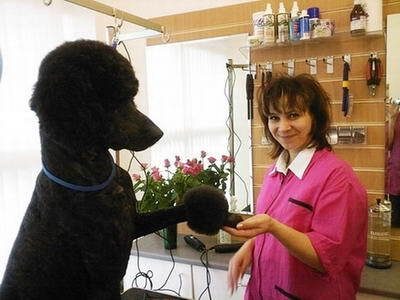 ”Since Pet Universe grand opened last month – which was attended by Russian newspaper Angliya – clients have been walking their dogs and cats through the doors for baths, nail clipping and eye cleanings. What’s more, owners of rabbits and guinea pigs have also been here to give their pets a treat. “But I’ve been very pleased by how much love, care and respect the British people show their animals”. 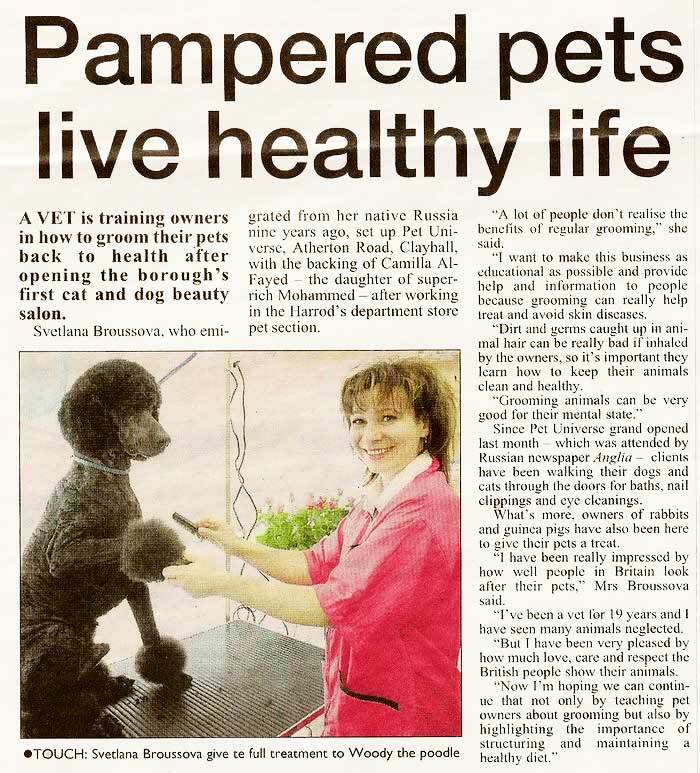 “Now I’m hoping we can continue that not only by teaching pet owners about grooming but also by highlighting the importance of structuring and maintaining a healthy diet.” – Mrs Broussova said. Smokey (Blue Persian) I’ve always wanted a Persian cat. I didn’t know they need a lot of grooming. I work full time so this is an issue for me. So thank God for Svetlana. Smokey has been a client at Pet Universe for a long time, where she gets a full clip and a bath, which she loves. I would strongly recommend Pet Universe to all who love their pets. Thank you Svetlana and Team for your wonderful work. I have two long haired cats that need to be groomed regularly. I would not take them anywhere else, Svetlana is so kind and reassures even the most nervous cat. My cats come out of the salon looking lovely and feeling proud. Highly recommend all the staff at this grooming salon. Have never found such an amazing Pet Salon! Everyone should treat their pets to a pampering with Svetlana!